Designed for round-tube gates of 1-5/8” to 2” diameter. Prevents gate from sagging over time. Allows the gate to open both ways. 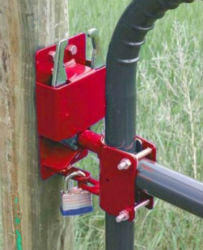 Mounts on wood post and accepts pad lock.